The compact crossover segment where the 2019 Mazda CX-5 plays is downright ruthless, and it's only going to get worse. With automakers from Ford to Volkswagen trying to woo the millions of Americans kicking their old sedans to the curb by offering sleek, new crossovers, the race to figure out a "one size fits all" vehicle is taking place in conference rooms across the globe. Mazda, however, is already somewhat ahead of the game; fully half the vehicles it sells in the U.S. are unibody crossovers—and the CX-5 is the most popular of them by far. As such, the 2019 Mazda CX-5 could have been just a phoned-in refresh. Instead, the carmaker took a three-pronged approach to improve and better position the popular compact crossover. At the very top of the list were two must-haves: Apple CarPlay and Android Auto. Folks nowadays expect to plug in their smartphones and simply move on with whatever their real or social media lives may throw at them. The days of being forced to deal with an automaker's own navigation, phone, and music interface are just about gone. Second, Mazda rolled out two all-new high-end trims for the CX-5: Grand Touring Reserve and Signature. With sales of decked-out models fitted with the latest tech, comfort, and safety features doing well across the board these days, it only made sense for the Japanese automaker to transfer a bit of swank from the range-topping CX-9's interior to its smaller sibling. Last but not least, some folks at Mazda thought that stuffing a bigger and more powerful engine in this crossover would be a great idea. So the 2019 CX-5 also looks to the CX-9 for its optional engine, the Skyactiv-G 2.5-liter turbocharged four-cylinder that produces 250 horsepower at 5,000 rpm on 93-octane fuel and 227 hp on 87-octane. Regardless of octane, Mazda claims the new engine delivers 22 mpg city, 27 highway, and 24 mpg combined in AWD trim. The 2.5-liter naturally aspirated four-cylinder with 187 horsepower remains the base engine. Tagging along with the new turbocharged engine are several upgrades to the CX-5's overall driving behavior. Standard on all trims of the 2019 CX-5 is Mazda's G-Vectoring Control Plus, an exclusive technology that improves steering response by applying small changes in engine output to slightly shift the balance of the vehicle as the driver turns the wheel. The updated system—which is also enhanced with new dampers and front-end geometry to reduce understeer—goes as far as dragging the outside front wheel when the driver straightens the steering wheel after diving into a corner at speed. 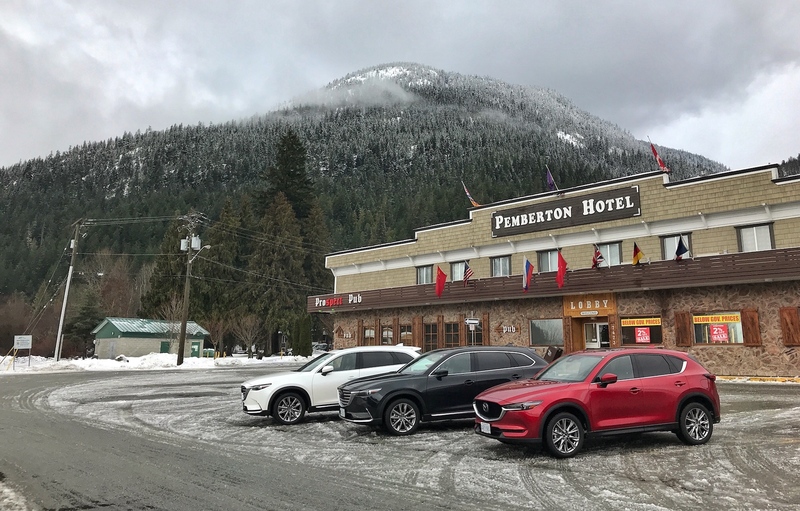 These three different approaches may sound good on paper, but the reason Mazda shipped me and other journalists to Canada in the dead of winter was to experience the overall package in total. And as Dave Coleman, Mazda's manager of vehicle dynamics engineering told me, the conditions are so sketchy up there that even diminutive engine, chassis, and suspension tweaks "would become much more evident than on dry, warm conditions." First-person first impressions: Right off the bat, it's hard to ignore the niceties of the new Signature trim. 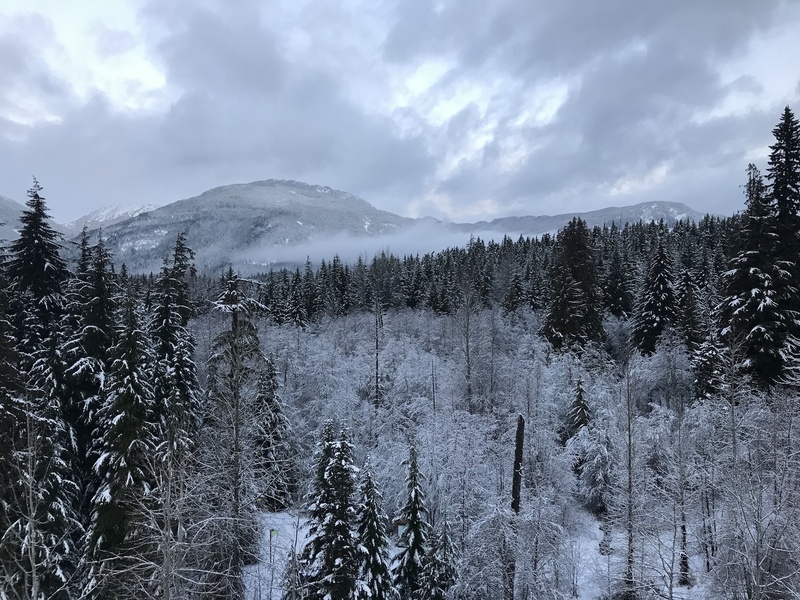 A heated steering wheel and heated seats were quite welcome while hopping in and out of the cabin during the day-long driving program. The Caturra Brown leather seats, wood trim, and ambient LED lighting added to the warm, soft glow of the CX-5's interior—but at 29 degrees outside and with snowflakes the size of hamsters smacking the windshield, it was up to the trim-specific satin chrome vents to keep me toasty. 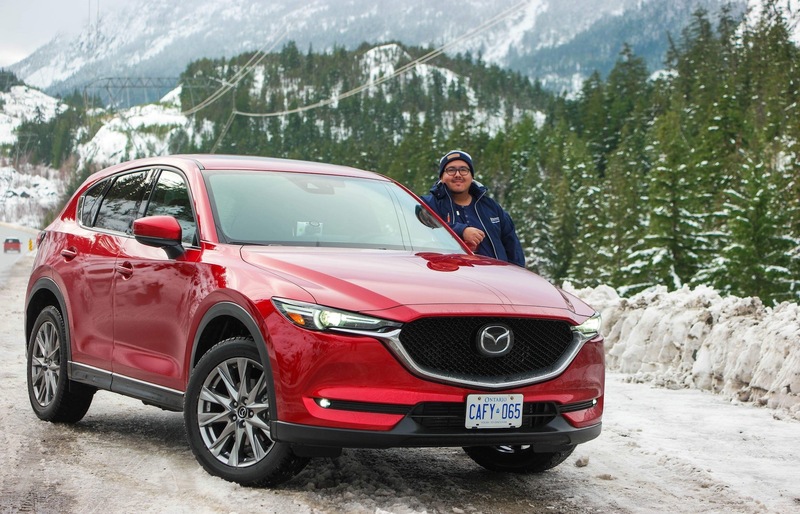 Mazda outfitted all the vehicles with winter-rated tires—not just for our own safety, but also because it's mandatory during winter in that part of the Great White North. 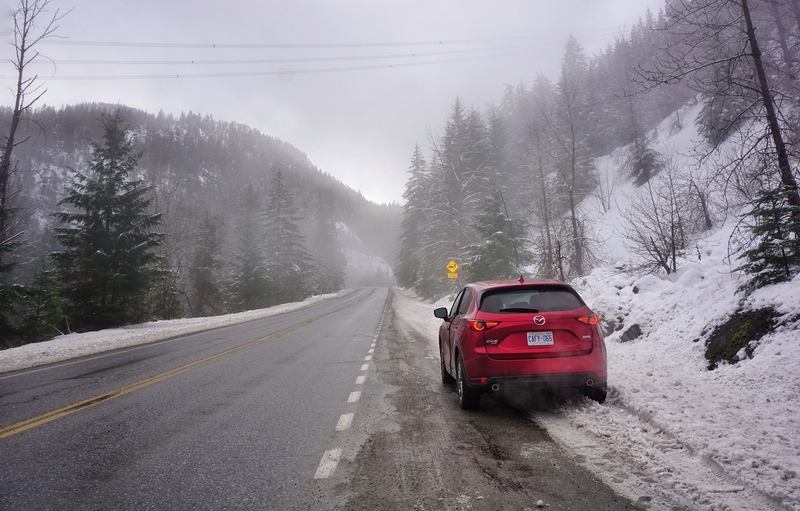 My test vehicle sported a set of 19-inch General Altimax Arctic 12s, which, despite my lack of initial trust, near-magically kept the CX-5 glued to the wintry road at speeds ranging from 25 to 65 miles per hour. It only took a handful of minutes to realize Coleman was right about the winter weather lowering the car's thresholds. The slushy mountain roads quickly put the i-Activ all-wheel drive and G-Vectoring Control Plus to work as I entered a long right-hander that crested on a railroad track at about 50 mph; the steering sharpened mid-corner as the differentials figured out where traction was needed, and I was coolly unwinding the wheel and lining up for the next turn before I knew it. 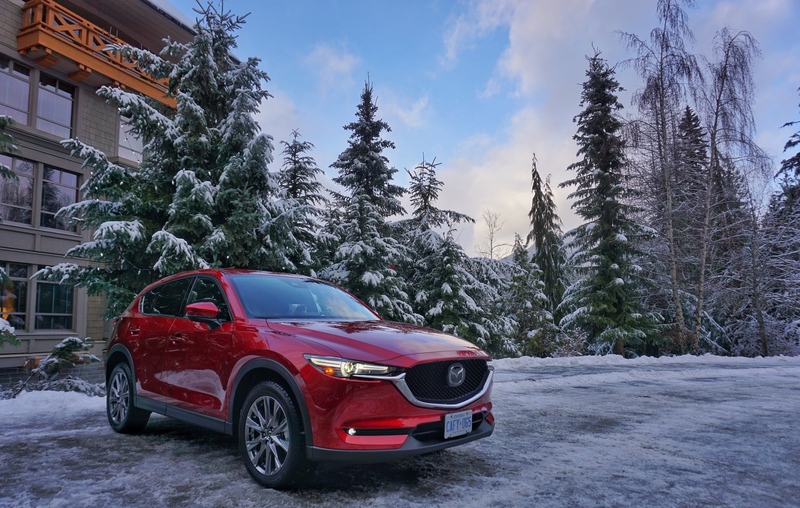 This became even more evident during the autocross course Mazda set up on a parking lot near Whistler Olympic Park, which featured two hairpins and a brief slalom portion that showed how Mazda's powertrain tuning allows for a bit of slip before it intervenes. (Coleman claims that a driver "should feel the car's limits before stepping in.") After a couple of hours on both the road and the autocross course, I felt quite familiar with the CX-5's dynamic limits, even if road conditions sadly provided no opportunities to stretch the new engine's 250 ponies, save for a spirited stoplight dash or two. After all, the sum of all these updates wasn't meant to make people scream Mazda's name from the top of a mountain. No, these subtle-but-important changes simply reassured me that Mazda is more than willing to improve a product that doesn't really need to be improved. In the end, the carmaker could've simply added Apple CarPlay and Android Auto and called it a day. That would've made the CX-5 even more competitive and attractive to young buyers—but the fact that Mazda went above and beyond speaks to the brand's heritage and vision for the future. Million-dollar sponsors not needed, just bring some good 'ole talent. Robert Noaker is officially the youngest-ever MX-5 Cup winner.